You may have heard people say that the biggest problem they have with pet ownership is that pets have shorter life spans than their humans. While it is true that pets age faster than their owners, the common belief that pets age seven years for each human year is not truly accurate. How a dog or cat ages, and their longevity, varies considerably between breeds. Generally, dogs and kitties reach “senior” status at approximately seven years of age, when they are considered to be between 44 and 56 years of age depending upon their size and breed. Cats tend to live longer than dogs, and larger dog breeds tend to have shorter lifespans than smaller dogs. Cats and dogs of all sizes have been known to age well into their 20’s. The oldest recorded age for a cat is 34 years and for a dog, 29 years. Senior pets often require extra care, and unfortunately, too many spend their final years in shelters when owners struggle to afford increased veterinary care, become too old or ill to care for them, or sadly, simply grow tired of them. Fortunately, most pet owners consider pets family members, and are willing to invest the time, energy and resources necessary for preventive and wellness care, as well as the management of chronic health issues. Many guardians benefit from older pet ownership; enjoying their pets’ loyal companionship, calmer demeanor, and reduced exercise requirement compared with younger more energetic pets. Attentive owners who provide lots of love, healthy food, proper exercise, high quality supplements, veterinary care, and medications when required, can help their pets live happily and comfortably, well into their senior years. Like their human companions, older pets are creatures of habit with predictable routines. Awareness is necessary to recognize any signs of illness or changes in behavior. It’s easy to dismiss some signs of health problems, including muscle weakness, incontinence, or the loss of agility as normal signs of aging. Early detection is key to pet safety and comfort, as timely interventions may be available to cure, treat or slow the progression of potentially serious age-related health conditions, such as organ disease, diabetes and senility. As your pet ages, more visits to the veterinarian may be necessary to seek dietary advice or address possible health issues. Common signs of aging may include graying hair, vision or hearing loss, reduced energy, joint stiffness, and behavioral changes. There are many natural solutions such as massage, water exercises, supplements, or acupuncture that can help your pets stay comfortable and mobile throughout their lives. Weight control. We tend to reward our pets with treats and food, which may lead to obesity as activity declines. Help your pet to stay trim and fit with the proper food for their age, as well as portion control and appropriate exercise. As well, sudden weight loss may also signal a health concern such as diabetes, cancer or kidney failure. In this case, a veterinary exam is advised. Cognition. The loss of cognitive function may manifest in different ways, including inappropriate barking or meowing, getting lost in familiar territory, incontinence, less interaction with family members, or signs of fear and anxiety. Maintaining proper levels of exercise at all stages of life helps to support cognitive function. Mental stimulation through exercise, such as mixing up the route on daily walks, helps to maintain proper brain function. Studies show the best mental stimulation for an aging dog is playtime with a younger dog or puppy! Dietary interventions, including the use of supplements like antioxidants, and omega-3 essential fatty acids may also support healthy cognition. Exercise. Lack of exercise results in loss of muscle tone and balance, while specific exercises help maintain strength and agility. Range of motion exercises similar to physical therapy can help to alleviate joint stiffness and make movement more comfortable. Short, frequent walks support cardiovascular health and weight maintenance. Massage can help to relieve stress, and soothe sore muscles and joints. Plus, your pet will enjoy the one-on-one attention from you. Vision changes. Aid your pet by turning on lights in the evening and keeping their normal path free of household items, shoes, or furniture that could trip them up. A ramp or movable stairs that help them up onto the bed or into the car is also very helpful for you and your pet. Dental care. If your pet has bad breath, it can be sign of tooth decay, gum disease, loose teeth, or an infection. Cardiac health is directly related to oral health, so watch for signs of pain or discomfort, such as changes in eating patterns, redness, bleeding, facial swelling or face rubbing on surfaces. Routine dental care and a healthy dose of probiotics can help to prevent dental problems. Nutrition. Like humans, aging is a gradual process that is greatly affected by nutrition. As the ability to digest and absorb nutrients declines, proper senior nutrition and supplements can help to minimize the effects of aging, enhance quality of life, and maintain overall wellbeing. Glucosamine/chondroitin may help to protect cartilage and support more normal functioning in pets with osteoarthritis. Immune supporting antioxidants, including vitamins C and E as well as antioxidant-rich berries, can help to support memory and cognitive functions, especially when combined with behavioral enrichment. Oxidative damage plays a central role in the development of chronic diseases. Dietary antioxidants for aging dogs and cats may provide protection against oxidative stress and support disease prevention. EPA and DHA essential fatty acids can help to reduce inflammation in dogs with arthritis, and support cell membrane health for improved cognitive function. 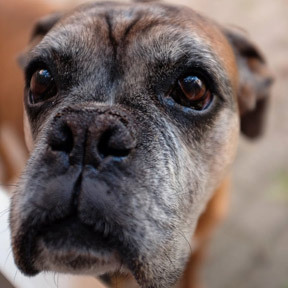 Higher levels of quality proteins are especially important for geriatric dogs. Optimal levels of vitamins, minerals and prebiotic fibers can provide benefits to pets of all ages. Probiotic supplements help control the critical balance of microflora in the digestive tract, relieving gas and bloating, and supporting healthy digestion, immune health and regularity. Healthy Aging Vet™ by Animal Necessity: Suitable for dogs and cats, this product provides vitamins, minerals, antioxidants, essential fatty acids and proprietary blends in support of brain, organ, digestive, vision and skin health and overall healthy aging. Age 3 – 5 years is a good starting point for all animals. Daily Multi for Dogs by Pet Naturals® of Vermont: These yummy soft chews provide 21 healthful nutrients, including vitamins, minerals, antioxidants, and essential fatty acids in support of overall wellness and immune, skin, cognitive, nerve health. Ocu-GLO™ for Medium and Large Dogs by Animal Necessity: This canine vision supplement was formulated by board certified veterinary ophthalmologists to protect vital eye cells from oxidative damage. Ocu-GLO™ provides a proprietary blend of 12 different antioxidants, plus B vitamins, CoQ10, essential fatty acids, lutein and additional vision supportive nutrients. Small dog formula also available. Daily Multi Vitamin and Mineral for Cats by Dancing Paws: This unique feline vitamin and mineral complex is designed to provide optimum nutrition for everyday wellness. The formula includes vital natural nutrients as well as essential antioxidants that promote normal growth and longevity. Human quality ingredients. Potency and purity guaranteed. Glyco-Flex® II Bite-Sized Soft Chews for Dogs by Vetri-Science®: These chicken flavored canine chews are formulated to support mobility and overall joint comfort, as well as healthy joint and connective tissue functions. Recommended for adult or maturing dogs needing moderate joint support. Feline formula also available. Glyco-Flex® III Feline Bite-Sized Chews by Vetri-Science®: This extra strength feline joint formula provides powerful support for joint comfort and connective tissue functions. Recommended for geriatric cats, and as a follow up to support normal recovery after orthopedic surgery. Canine formula also available. Probiotic Everyday Bite-Size Chews for Cats by Vetri-Science®: One chew provides 100 million CFU of a patented, highly stable probiotic along with prebiotic FOS for digestive, immune and gastrointestinal support. Probiotic Everyday Bite-sized Chews for Dogs by Vetri-Science®: The once daily chewable pre-and probiotic for dogs provides beneficial microorganisms for digestive, gastrointestinal and immune support. This entry was posted in Home and tagged Care for Our Aging Pets, Cognition, Daily Multi for Dogs by Pet Naturals® of Vermont, Daily Multi Vitamin and Mineral for Cats by Dancing Paws, Dental care, exercise, Glyco-Flex® II Bite-Sized Soft Chews for Dogs by Vetri-Science, Glyco-Flex® III Feline Bite-Sized Chews by Vetri-Science, Healthy Aging Vet™ by Animal Necessity, Nutrition, Ocu-GLO™ for Medium and Large Dogs by Animal Necessity, Probiotic Everyday Bite-Size Chews for Cats by Vetri-Science, Probiotic Everyday Bite-sized Chews for Dogs by Vetri-Science, Vision changes, Watch for Signs of Health Problems in Older Dogs: http://www.akc.org/content/dog-care/articles/health-problems-older-dogs-senior-old-age/ When You Love an Old Dog, Weight control. Bookmark the permalink.